Dr Julian Wiseman is Professor of Animal Production at the University of Nottingham, UK. He has published widely in the area of non-ruminant nutrition, presented papers at some of the leading international conferences in this area and has written or edited a number of books on animal nutrition. He is co-organiser of the annual Nottingham Feed Conference. Pig meat is the most widely-consumed meat in the world. Previous growth in production has relied, in part, on more intensive systems. In meeting rising demand, these systems face challenges such as the ongoing threat of zoonotic diseases, the need to improve feed efficiency in the face of rising costs, the need to reduce the environmental impact of pig production and increasing concerns about animal welfare. These challenges are addressed in the three volumes of Achieving sustainable production of pig meat. 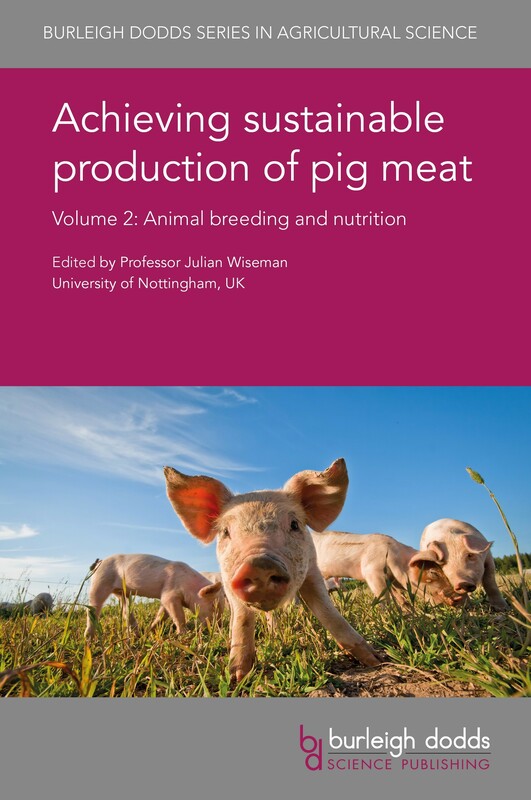 Volume 2 looks at pig breeding and nutrition. Part 1 starts by reviewing advances and constraints in conventional breeding, the development and use of molecular breeding techniques, as well as factors affecting functional traits such as reproductive and feed efficiency. The second part of the book looks at current research on meeting pig nutritional requirements, including understanding and modelling pig nutritional requirements to optimise feeding, as well as the role of vitamins, exogenous enzymes, growth promoters, prebiotics and probiotics. With its distinguished editor and international team of expert authors, this will be a standard reference for researchers in swine science as well as producers, government and other organisations involved in supporting pig production. It is accompanied by two companion volumes which focus on safety, quality and sustainability as well as animal health and welfare. "Pig production is one of the major protein sources for society worldwide. This impressive collection of articles from leading pig scientists illustrates how much we know about the domestic pig - and where opportunities to expand our knowledge will emerge. It captures both the academic and commercial perspective and will undoubtedly provide the go-to-reference for students, teachers, practitioners alike for many years to come." "What sets this book apart is its provision of such a comprehensive review of developments in pig nutrition as well as breeding. To do this it brings together some of the world’s leading experts in this field of research to produce an unbiased, accurate and accessible guide to a critical part of pig production."